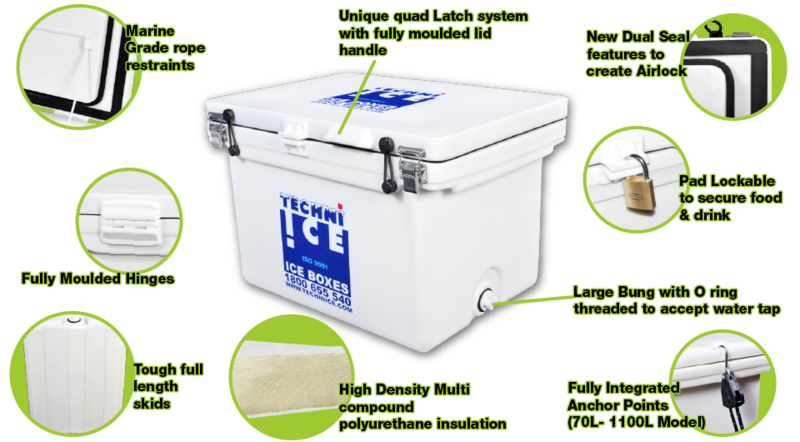 The Legendary Techniice Company have several ranges of ice boxes with the Classic range being the most popular. Robust , Tough , Heavy Duty Commercial Grade Icebox Coolers that are hand crafted and now built with a unique Dual Seal Feature designed to create airlock between two seals and enhance performance. The Box is designed with a DOUBLE THICKNESS LID to provide double insulation from the top where most radiant heat enters the Box . The boxes are constructed with HIGH DENSITY MULTI COMPOUND POLYURETHANE INSULATION injected under high pressure into the walls and double thickness lids for stunning performance. These boxes also have a LID LIP HANDLE so you can easily lift the lid even when there is undue suction from the vacuum in the box. The UNIQUE QUAD LATCH SYSTEM comprises both stainless steel latches plus Constant Pressure Pull downs for increased performance and lid stability over 32 °C . They are built with COMFORTABLE FULL LENGTH GRAB RAILS so you don’t have to bend down so far to pick up. The Classic range also have a PAD LOCK OPTION so you can secure your food and drinks or for secure storage when used as storage box. They also have a LARGE BUNG WITH ‘O’ RING threaded to accept water tap for drinking water or garden hose fitting to drain water from ice. The Taps are available through most hardware stores. These Boxes now come with FULLY MOULDED HINGES with corrosion resistant pins and they also have MARINE GRADE ROPE RESTRAINTS for additional support to self supporting hinges, Most companies don't offer these ropes in a view to cut costs. The Classic Range of ice coolers are built with a SEPARATE HIGH QUALITY FOOD GRADE INNER LINER to make your food safe from harmful chemicals. Costs more to make them like this but worth it. The ice boxes are cleverly designed to have TOUGH FULL LENGTH WHITE SKIDS on the bottom on all models up to 100L and additional side skids on 100Ltr models and above to prevent scuffing in trailers and marking boats, and also gives you the ability to Drag these Big Ice boxes without having to lift them on any Terrain. All 70L and above iceboxes are designed with ANCHOR POINTS so the body or the lid can be anchored to the boat or Ute .This way you can continue to open and close the lid when the box is still anchored. Overall The Classic Range are tough iceboxes which have all the features you can imagine. The basis of these boxes are a true commercial ice box. They are the boxes that company built it's reputation on. And they've got double seal system now like the signature series. A little bit different type of seals than what the signature series runs. The signature series is a premier box above this range. But it's something that's been added to the box in the last year. This same box has pretty much been modified over the years. So wherever there's been improvements made, the company's added them to increase it's performance and this was just one of those improvements. It was one of the first boxes to come out with dual seals and still has them. It's got a rope to support its hinges. All of the classic series has these. And keeping in mind these boxes have a lifetime guarantee on them. And I think when you look at the fact that these ropes can pretty much take the weight of the entire contents of the box. If it was pushed backwards by the lid, the rope would support the hinges, so they're very strong. And they do protect, despite the hinges already being very strong. These will give it ultimate protection if someone comes along and pushes the whole box backward or tries to move the entire box. And you can imagine if they're trying to move an 1100 liter, they're actually trying to push a ton, and pull it by the lid. So it's something we've always put on them. And it's actually more expensive to build a box like this and have them on. And the only boxes we have that don't have these on are boxes such as the signature series where they use a hinge that's built into the body of the lid and the base of the box rather than a separate add on hinge like these have. It's got a lot of the features like being able to use the padlocks and such on the front. And so you can lock things up. It's got also anchor points on the sides. These goes right through the lid and right through the body of the box. So, you can actually anchor the base down independently, or you can put the ratchets straight over the top like this or under there and make it so you can still open the lid. The other thing with this series is they've got two lots of latches. And the reason that was done really is it just gives you a little bit more stability on the lid on these particular models. But also, when you have a situation where the box is going to be locked up for a very long time, the original thought process behind this was you could actually keep the lid locked with these bungee cords. The idea of that is it puts minimum pressure on your seals over a long period. If you were using it to store things and you just wanted to keep dust out of the box and things like that, you could use these rather than compressing your seals down completely and hard with these types of stainless latches here. A lot of boxes these days have these stainless locks and they are very good. But, you have to be mindful that if you're going to go and store something in it and then put it away somewhere, if you haven't got these on, you'd be better not to lock these down, because if you're going to store it for months or years on end somewhere to store some gear in, then just keep in mind you're better just to leave the lid closed if you can. Or use these if it's got them on it. It does give the seals some chance to move; and that's about it. They've got thick walls, thick lids, and they use a high grade polyurethane insulation which is injected at high pressure into the lid and walls. And they've got a separate food grade liner in them. And of course they've got a bung lower than the base of the box for complete draining, like most of the Techni-Ice boxes. And again, the bungs on these are like the other boxes in the range. You can put taps on them, you can put hoses on them, and they're set up with a thread that can have those various options on them, for draining water out, or for putting a tap on it; or if you want to use it as a food grade or water grade for drinking vessel.